Nanotechnology — or the engineering of functional systems at the molecular scale — seems to be the flavour of the decade, so much so that anyone can just slap a “nano” label on his technology to make it sound sexier. Today, we have nano textiles, nano pens, nano facial rejuvenations … the list goes on. The use of this word without any proper verification irritates Dr Rezal Khairi. 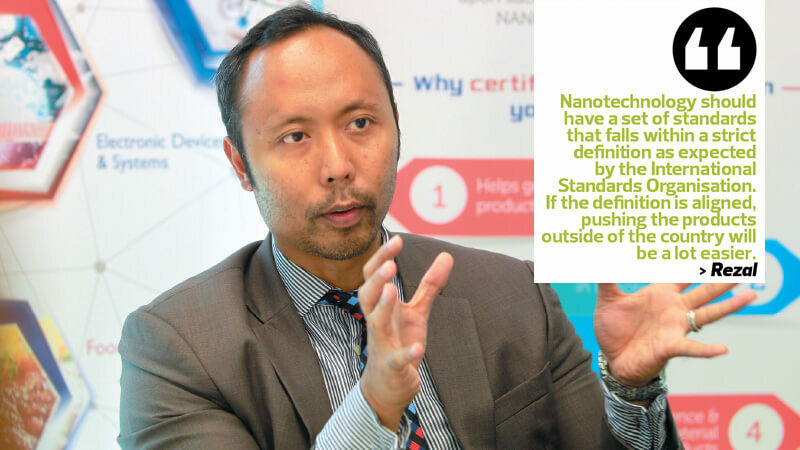 That is why the CEO of NanoMalaysia Bhd teamed up with Sirim QAS International Sdn Bhd and the Ministry of Science, Technology and Innovation to launch the NANOVerify programme in 2015. “We found that there were 512 products in Malaysia that claimed to have processes or products with nano elements. How true is this?” says Rezal. As at May, NANOVerify had only certified 39 products with proper nano elements. Malaysia is the sixth country in the world to introduce the programme after the UK, Taiwan, Iran, Russia and Thailand. Rezal says the programme is imperative to protect consumers who may pay a premium because of the nano label. The stamp of credibility helps companies sell their products more easily here and abroad. “Standards and certification are the key to all innovation, especially if you want to venture into other markets. Just like the USB thumb drive — it can come in many designs, but the interface is standard across the world,” says Rezal. Late last year, NanoMalaysia reached an agreement with Taiwan to acknowledge this logo. This had an impact on the movement of nanotechnology-related products between the countries. “Taiwan has pushed for eight companies to apply for our logo to penetrate the Malaysian market. We have reciprocated by advising our small and medium enterprises (SMEs) to carry the Taiwanese nanotech logo — the NanoMark — so we can exchange goods without any barriers,” says Rezal. Now that it has engaged with Taiwan, Russia is next on the list. Rezal also plans to work with the Ministry of Domestic Trade, Cooperatives and Consumerism to make the programme mandatory for all processes and products with nanotechnology elements. This will allow the company to possess and control the database of nanotechnology in Malaysia, in addition to giving it access to conduct more investigations in terms of product safety and performance. NanoMalaysia was incorporated in August 2011 as a commercial vehicle to represent the government in driving the adoption of nanotechnology in the country. Its responsibilities include the commercialisation of research and development, industrialisation, facilitation of investment and human capital development in nanotechnology. Currently, the company is focusing on developing four key sectors — electronic devices, food and agriculture, energy and environment, and healthcare. “When NanoMalaysia was established six years ago, it was pretty much a shell entity with no one to run it. When I got back after graduating abroad, I recognised the opportunity and raised my hand. In 2012, I assumed the post of chief operations officer and carefully crafted the business model of the company so that NanoMalaysia could complement and add value to other government-linked agencies,” says Rezal. The partnership is a joint research programme to develop nanogel star polymer-based materials that will provide the foundation for better anti-microbula coatings and drug delivery applications. This development in drug delivery applications will have a major role in the treatment of diseases, especially cancer therapy as the cancer-detecting nanoparticles carrying anti-cancer drugs can be delivered specifically to cancer cells. With this new, more targeted technology, patients will be able to avoid chemotherapy and its side effects. “Because it was still in the R&D stage, the programme was funded by the Ministry of Higher Education. We sourced researchers from universities, formed a consortium and sent them to IBM’s research centre in San Jose, the US, for six-month rotations. The programme ended in 2015 and we are now in the process of filing for intellectual property protection to co-own the rights to further develop and possibly commercialise the product,” says Rezal. But the path to commercialisation never runs smooth. “It is going to take longer than it would for other sectors, possibly 7 to 10 years. This can be shortened by having a strategic partnership with players that have extensive experience in the healthcare space, so we will most probably do that when the time comes,” he says. The second major milestone was the launch of the National Graphene Action Plan in 2014. Graphene is a single-atom layer of graphite that is considered the strongest, thinnest and most stretchable crystal. The plan was a collaboration with Agensi Innovasi Malaysia and the Performance Management and Delivery Unit (Pemandu) to focus on five applications that would be useful for the country — rubber additives, plastic additives, Li-ion battery anodes, conductive inks and nano fluids. “Last year, we received direct funding from the government to facilitate the technology transfer. With that, we became a pseudo-venture capitalist, investing RM500,000 to RM1 million in companies willing to take the bold step of innovating with this material and putting it in their products. We will co-own the patents, then help the companies commercialise their products,” says Rezal. Since its launch, the action plan has successfully activated 21 graphene-based projects. As NanoMalaysia wants the technology transfer to take place as fast as possible, the plan uses a virtual platform model where enterprises, researchers, the government and the private sector work together to push for commercialisation. Rezal says this will make the process a lot faster than setting up a new subsidiary. “In the past, there was a schism between researchers and industry players. But it is best for the country if they work hand in hand. They must play out their core competencies. R&D people can still do what they do best, bearing in mind that the entrepreneur’s requirements are to meet the end user’s demands,” he says. Being at the forefront of technology, NanoMalaysia is aware of the Fourth Industrial Revolution and the digital economy. Rezal says nanotechnology can be part of the bigger picture through devices, specifically Internet of Things-related ones. “IoT is about sourcing data from one end to the other. To source data, you need to be able to sense data, and this is our area of expertise,” he says. IoNT has been listed by the World Economic Forum as the leading emerging technology of 2016, followed by next-gen batteries, blockchain, two-dimensional materials (such as graphene), autonomous vehicles, organs-on-chips, pervoskite solar cells, open Artificial Intelligence ecosystems, optogenetics and systems metabolic engineering. The company is also eyeing the smart city concept in terms of end-to-end township monitoring. This includes waste management, environment and weather sensing, energy storage and renewable energy generation. The projects within the IoT space are done in collaboration with Mimos Bhd, which has been mandated to look into the information and communications technology space.